Big Oil is hiding behind the scenes of COP21 -- what does it hope to gain? Big Oil is hiding behind the scenes of COP21 — what does it hope to gain? In Paris, more than 40,000 delegates, journalists, NGOs and policy experts have gathered at the Le Bourget conference center to hammer out a climate change deal — one that might see the world avert at least 2 degrees C of warming. Among them are also corporate executives from the fossil fuel industry, yet unlike other COPs (Conference of the Parties) where these companies were very vocal renting booths and speaking at high profile events, at COP21 things are a lot more quiet. The narrative has changed as well. Most oil companies now have no issue admitting climate change is real and caused by combustion of fossil fuels (which they supply). Instead, companies like Shell or BP have positioned themselves as part of the solution, and not the problem. But how can their interests possibly align with the state goal of COP21? In short – they don’t. There are two main points that fossil fuel companies are lobbying at this conference and, most of all behind the doors back home where they enjoy exclusive consideration from governments. 1) Tax carbon and 2) use gas instead of coal. Then, there’s talks of how energy companies now work hard to lower their operational emissions and invest in renewable energy. These are always welcomed, but when you consider just how much renewable energy these companies are actually feeding the mix compared to how many emissions they generate with their other operations, it’s just eye glitter — an attempt to stay relevant in a changing world where these companies won’t have a place anymore. But while they’re still holding on strongly to past paradigms, fossil fuel companies risk killing any consensus in Paris. There are more than 50 corporate sponsors paying to keep the lights on at COP21, which costs $200 million to organize. Among these are companies which don’t have a perfect sustainability history, to use an euphemism, like: EDF and Engie (both own coal plants responsible for huge emissions around the world), Air France (who has actively opposed emission reduction targets), GDF Suez (pro-fracking lobbying and another huge emitter) or BNP Paribas (a multinational bank with billions of dollars invested in coal mines and coal-fired power plants). Scientists agree that for the world to avert 2 degrees warming — again the stated goal of this conference and anything above this threshold is nothing short of a climate disaster — then 80% of all fossil fuel reserves need to stay in the ground. Yes, a transition won’t happen overnight and we’ll still need to burn fossil fuels until we’ve completely phased them out by 2050. In the meantime, taxing carbon – maybe under a tax revenue neutral framework, as suggested by Elon Musk – will be essential to meeting this goal. But taxing carbon is just another licence for fossil fuel companies to go about business as usual. They’ll just pay to pollute, not shut down. Concerning the taunting of gas over coal, this is yet another manipulative measure. The industry says that burning gas instead of coal is a lot cleaner or, let’s say, less damaging. The statement is true in this form, but from a life cycle perspective gas is actually worse, since there’s a lot of methane leaking during the extraction process. “The presumption of your question is that the 2°C is a given. But I think that to answer the question, you have to… say this is not a given. And of course that immediately disenfranchises a lot of people, because that’s the model… they’re all discussing that over there… (gestures towards negotiation room)”. Before COP started, the CEOs of some of the biggest oil & gas companies in the world, including BP, Shell and Total, held a press conference asking for immediate action against climate change and urging world readers to reach an agreement in Paris. 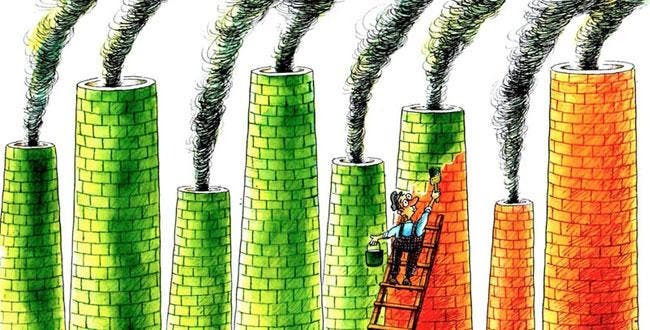 Greenwashing, again. It’s no wonder that fossil fuel companies prefer keeping a lower profile here at COP21. Instead, they’ve resorted to ad campaigns and sponsorships. Media interviews are regularly refused and, when executives do speak at one of the countless conference events, the moderator is either part of an energy company or at the very least an industry-friendly voice. Sometimes, corporate executives come clean (not by intent), like when Gérard Moutet, a vice-president with oil and gas company Total, took the stage at Press Conference 1 right after Al Gore made an emotional speech, saying: “Oil and gas … will still be an important part of the mix for the foreseeable future. If we look to 2030, oil pollution will be about the same today and more gas pollution.” This veil is kept by recent developments in the United States, where New York’s attorney general is investigating Exxon over allegation that the company failed to warn its investors of climate change related risks. If 80% of fossil fuel reserves need to stay in the ground, these become stranded assets and shares will plummet, but this isn’t disclosed anywhere. That’s what likely got Hone to react so dodgy. No fossil fuel company wants to be in Exxon’s place right now, but all of them might face similar charges next year. These developments, of course, have not gone unnoticed by civil society. Some we’ve featured here on ZME, like the faux ads raising awareness on corporate greenwashing or the hundreds gathered in front of the Louvre protesting against oil sponsorship of COP.